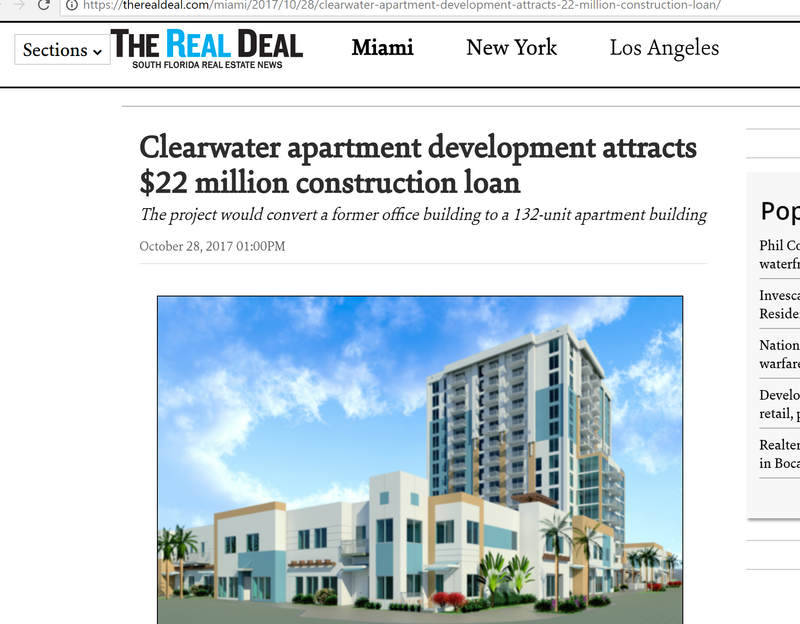 A Chicago-based mortgage banking firm made a $22 million loan to finance construction of an apartment building in Clearwater. The 132-unit apartment development, called The Strand, is unfolding at a 15-story building in downtown Clearwater, which originally was developed as an office building. The owner of the property is 1100 Cleveland LLC. Prior to the sale of the building at 1100 Cleveland Street in Clearwater, it was gutted in preparation for conversion to a luxury condominium. Maverick Commercial Mortgage of Chicago provided the $22 million non-recourse construction loan with a two-year term and one 12-month extension option. The development manager is Chicago-based Glenstar Properties, a commercial real estate company that develops, acquires, leases and manages institutional-quality properties. The Strand development, designed by Kimmich Smith Architects, will feature a swimming pool, hot tub and covered parking, plus a party room with kitchen, work shop with tools and equipment, and business center with private offices and conference room.